The PowerArm™ hockey training exercises and arm strengthening will help the player pass the puck faster and more accurately as well as shoot the puck faster and more accurately while becoming an elite player. Building a great foundation of strength is necessary for young hockey players. Quickness and power is essential to compete with the best and the PowerArm™ is the tool that can help you maximize your performance. Success in moving the puck requires explosive and powerful arms. The PowerArm™ hockey training exercises will help both young and adult hockey players build the muscles necessary for: increasing shot power and velocity, increasing hand quickness and stick-handling skills, in addition to strengthening back for increased balance, and building strong shoulders to withstand checks. Using the PowerArm™ will provide the serious player with the hockey training exercises and arm strengthening needed to attain peak performance and improve their overall game. The “snap” the player achieves from having strong wrists and forearms is crucial in improving passing speed and controlling the direction of the puck when shooting on goal. The arm strengthening PowerArm™ device is small, lightweight and easy to add to any gym bag of just lay it beside your bed or desk at home. Pick it up and do 10 - 15 minute workouts multiple times during the day. 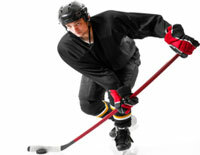 There are simple hockey training exercises included with each product. The PowerArm™ hockey training exercises help build the hand speed and wrist action necessary for shooting a goal or passing the puck to a teammate. The PowerArm™ will build the muscles necessary to maximize your potential arm strength for both offensive and defensive moves. Increased velocity of the puck makes it harder for the opponents to defend. The PowerArm™ provides a dynamic user-adjustable resistance workout and hockey training exercises that will isolate and strengthen key muscles groups and help prevent painful injuries such as tendinitis, sore elbows and painful wrists. Being able to increase the velocity and accuracy of shooting or passing a puck requires strong and flexible wrists and forearms. Using the PowerArm™ and specific hockey training exercises will deliver results.